Pharmaceutical industry is a quality critical industry because it has close ties with people's life and health. A Vision inspecting system is often applied on the assembly line. The typical inspected objects usually include capsule, injection, bubble cap, label of the package and etc. All Daheng Imaging cameras undergo thorough critical tests to ensure that they can meet the industrial and professional requirements under the tough conditions. Pharmaceutical production usually does not take place in a comfortable lab, but reliable inspection results in a tough environment are a guarantee for the drug quality. 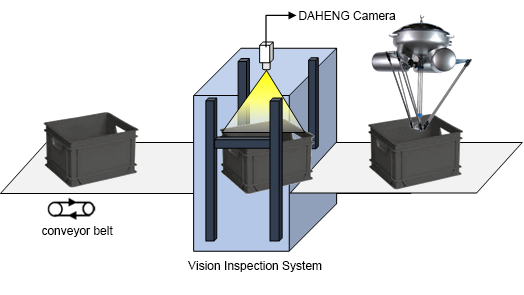 To get the reliable inspection results, Daheng Imaging cameras offer outstanding quality images with high-performance digital interfaces, as well as rapid trigger respond can ensure capture very precisely, furthermore, trigger signal filter function ensures that only the right pulses are inputted into the camera. No wrong image and no missing image are the most important keys for the vision system in pharmaceutical industry. Daheng Imaging cameras are just good at that. The vehicle wheel set's fault and dimension dynamic detection system is a safety inspection system which is installed on the railway, it can be used to detect the wheel set’s geometric parameters that can check the tread wear and the flange wear. By computer analysis, the system can forecast the safety status of the vehicle wheel set, and make it convenient to deal with the failure of the vehicle in time. 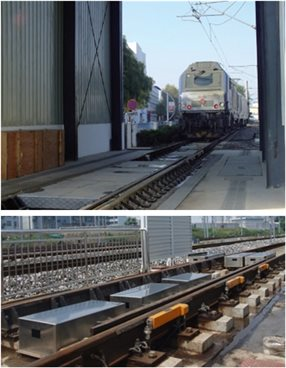 The system is a guarantee for the safety of a train, It can be used in online survey, locomotive warehousing survey, High-speed rail warehousing survey, subway warehousing survey and etc. All DAHENG IMAGING cameras undergo thorough critical tests to ensure that they can meet the industrial and professional requirements in the harsh conditions. The work environment of the vehicle wheel set usually is challenged, so the reliability and stableness of the camera is very important. In this application, some red spectrum lasers or some near-infrared lasers usually are used. The near-infrared lasers are more suitable in the outdoor environment than the red spectrum lasers, because the visible spectrum laser is easy to be interfered by the sun light, some near-infrared cameras with some near-infrared lasers are required. The MER-131-75GM-P NIR and the MER-232-48GM-P NIR are near-infrared GigE cameras which are equipped with On-Semi PYTHON CMOS sensors, the sensors have optimized response in the near-infrared band. MER-131-75GM-P NIR and the MER-232-48GM-P NIR are powered over Ethernet and have opto-isolated I/Os. They are designed to pass critical EMC test, they have the ability to meet the electromagnetic compatibility requirement of rail traffic. A 3D scanner is a device that analyses a real-world object or environment to collect data on its shape. The collected data will be used to construct digital three dimensional models. Collected 3D data is useful for a wide variety of applications, it commonly is used for artistic design, industrial design, reverse engineering, quality control inspection , prosthetics and the digitization of cultural artifacts. It also is used for the online shopping , the production of movies and the video games. 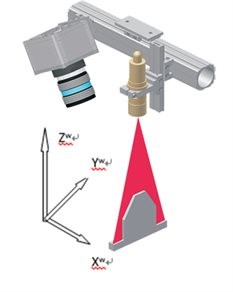 Many different technologies can be used to build these 3D-scanning devices, but the common methods are the stereo vision and the laser triangulation with sheet of light. In a stereo vision system, two or more cameras with structure light or encode grating are used, you can derive 3D information of the surface of arbitrarily shaped objects. The basic idea of the laser triangulation with sheet of light technique is to project a thin luminous straight line that is generated by a laser line projector onto the surface of the object which is to be reconstructed. By deriving the laser line coordinate in these images, Y,Z world coordinate can be calculated by the calibration relationship between the image plane and the laser plane. Moreover, the object moves along X coordinate axis, the camera could capture a serial of the projected lines images, thereby getting X,Y,Z coordinates of the object. We generally can see all kinds of glass bottles around our life such as beer bottle, drink bottle, perfume bottle, etc. These glass bottles usually belong to mould bottle which are produced by pouring liquid into a mould to create a given shape. And there is a glass tube of another kind to be used in medicine or pharmacy, they are usually produced without a mould and need more critical quality. 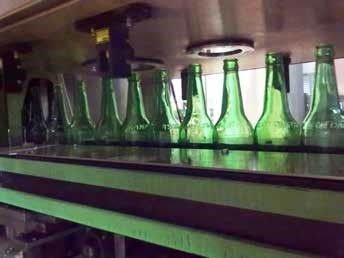 In a glass bottle plants, vision systems are typically installed in the hot end or in the cool end of the process, the inspection machine employs high-speed cameras to acquire real-time images of a glass bottle, then gets detailed geometric parameters of the bottle and verify the detects. By comparing the measuring results with the pre-set dimensional parameters, the inspection machine can find out waste bottles and eject them from the production line, thereby providing a strong guarantee for the bottle quality and production efficiency. MER-131-210U3M, MER-132-43U3M, MER-503-36U3M and MER-131-75GM-P of MERCURY family have some special characters such as high frame rate, precise capture, plug and play, stable multi-camera running and so on. 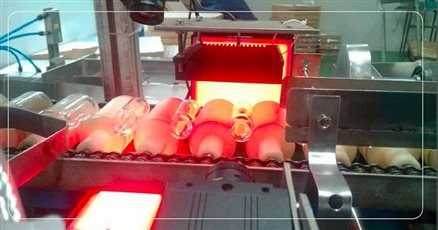 All these make them become engineer's favorite cameras in the inspection system of glass bottle . In the traditional logistics industry, the goods are usually sorted, read barcode and recorded by manual operation, and then they are sent to the picking area. Because the types of goods, the shapes and materials are different, a large amount of manpower are required for the sorting. It not only takes a long time and have a high sorting error rate, but also has a high labor cost. It would greatly slow down the delivery speed . To find a solution for this situation, DAHENG IMAGING developed an vision sorting system that can rapidly classify the objects and get the position of the objects. This system is composed of DAHENG IMAGING’s compact digital camera, using USB3.0 interface to transfer data to a PC controller for analysis and processing. Finally, the Gigabit Ethernet interface is used to transfer the processed data to the robot for guiding the robot to perform the ‘pick up’ process. The sorting system can be used not only for automatic sorting in the logistics industry, but also for various industrial applications such as positioning, inspection, measurement, etc. as shown in the picture below. 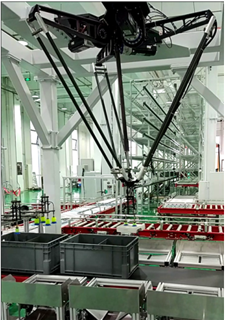 This logistics vision sorting system is built by DAHENG IMAGING MERCURY cameras and a delta robot. The whole system is mainly composed of 3D image acquisition module, 3D image processing module, image coordinate transform to robot coordinate module, hand-eye calibration module, and robot control module. First, "3D image acquisition module" captures the high-speed moving baskets on the conveyor line, and obtains three-dimensional information of the goods in the baskets. This image acquisition module is composed of two MERCURY cameras and laser light source. Both the FOV(field of vision) and the MR (measure range) cover the whole basket. Stereo vision method is used to reconstruct 3d geometry information of the object and get position of the object. 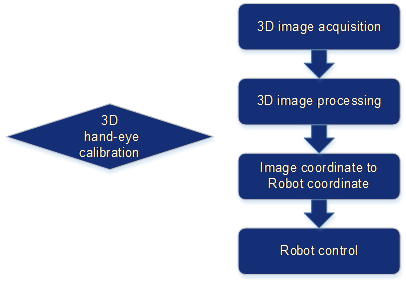 After getting the 3D geometry information of the objects, "3D image processing module" divides the 3D features of the object into several separated pieces, and analyzes the most suitable grasping position of the goods, and then passes the position data to the "Image coordinate to robot coordinate" module. 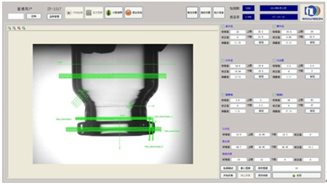 By using the result of hand-eye calibration, the "Image coordinate to robot coordinate" module transforms the most suitable grasping position of the goods which get previously to the robot coordinate. Through the communication protocol, the robot coordinate data will be transmitted to the robot and performed by the robot control module. According to the grasping robot coordinate, the robot will grasp the suitable goods precisely. Embedded vision has become very popular in recent years, and it is well suited for some applications where the primary emphasis is on low cost, power consumption, size and weight, such as pilotless automobile, unmanned aerial vehicle, robot and medical device etc. Over the past decade, personal computing platforms based on Intel architectures have maintained a substantial lead in processing power, ensuring their continued dominance of most industrial computing applications. But over the last few years, the architectures of ARM processors have been substantially upgraded by adding cores, instructions and faster pipelines to increase their performance, they have begun to compete head-to-head with Intel and AMD PC processors in industrial application. Embedded system continues to stand for low cost and low power consumption but it does not mean low processing power anymore. Today thanks for the tremendous progress of computational capacity, data accumulation, mathematical tools and so on, we can see the rapid growth of artificial intelligence (AI). Convolutional Neural Network (CNN) is a mathematical method as one part of AI field, and it is broken down into two parts: training and inference. A typical application of AI embedded system is for the pilotless automobile. In this application, AI technologies are used for the detection of obstacles, the recognition of signs, traffic lights, cars, and pedestrians etc. A bank of cameras are arranged on and around the automobile and responsible for offering the real-time images. The data training commonly has been performed in the data center before the automobile run on the road. And the inference algorithm that makes the detections to achieve is embedded on ARM platform. As one popular ARM platform, NVIDIA Jetson TX1 or TX2 platform is especially popular in this application due to its ARM+GPU processor, as well as GPUs are very good at manipulating computer graphics and image processing, and GPUs' highly parallel structure make them more efficient than general-purpose CPUs for algorithms where the processing of large blocks of data is done in parallel. In a successful story, DAHENG IMAGING MER-231-41U3C is used on NVIDIA Jetson TX2 for the real-time driving detection. Auto gain and auto exposure time of USB3.0 camera's features will make it well suit for all kinds of weathers and outdoor environments. The ARM Linux SDK of USB3.0 camera is based on 'libusb', which provides a generic access to USB device, so the data of USB3.0 cameras can freely be transferred to any ARMV7 or AMRV8 platform.